Review: I say this every time – Stuart Woods Stone Barrington books are no literary feat by any means. They are simply good fun escapism. Nothing more than some brain candy for a few days. And that’s okay. Sometimes that’s exactly what a reader needs! This particular installment (#10 in the series) introduced me to Mr. Woods’ other recurring character, Holly Barker. And I’m not entirely sure I liked her. She came off as Stone Barrington in a female body and I don’t know exactly how that translates in her own series. Ed Eagle, another of Mr. Woods’ characters also has a small role in this book so I was introduced to two new characters. This book had Holly on the hunt for a particularly nasty fugitive. The FBI wants him in Witness Protection so he can testify in some cases for them while Holly wants him for something like 12 murders back in Florida. I think most of my issue with this book is that Stone is not stupid. Woman-crazy, sure. Stupid, no. So the mere fact that he went off with Holly (who was half-cracked over catching the fugitive) really didn’t translate well for me. I think I just didn’t care for Holly as a character. Or maybe I just didn’t like the character crossover – I know they do that sometimes with the TV shows I watch and I very rarely like those episodes. Either way, not a terrible book, but not one of my favorites in this series either. On to the next one … there’s only 30 something books to go! Blurb: A young man is found in a riverside park, his head bashed in with a rock. One clue is left behind to uncover his identity—an admission stamp for the local gay club. DS Lucy Black is called in to investigate. As Lucy delves into the community, tensions begin to rise as the man’s death draws the attention of the local Gay Rights group to a hate-speech Pastor who, days earlier, had advocated the stoning of gay people and who refuses to retract his statement. Things become further complicated with the emergence of a far-right group targeting immigrants in a local working-class estate. As their attacks escalate, Lucy and her boss, Tom Fleming, must also deal with the building power struggle between an old paramilitary commander and his deputy that threatens to further enflame an already volatile situation. Hatred and complicity abound in McGilloway’s new Lucy Black thriller. Compelling and current, Bad Blood is an expertly crafted and acutely observed page-turner, delivering the punch that readers of Little Lost Girl have grown to expect. Review: This is the fourth book in the Lucy Black series and I have read the previous three (Little Girl Lost, Someone You Know, The Forgotten Ones ) and thoroughly enjoyed all of them! So when I was pitched this book I eagerly accepted it to review. I was looking forward to falling back in with Lucy and Tom. Gay rights, immigration, and the legal issues of drugs were all integral parts of this book. The way they were portrayed definitely leaves the reader with some tough questions to ask themselves – how would you react in certain situations that these characters were placed in? I will say that going this route with the storyline gave this book an extremely current feel. While this book is set in Ireland right before the Brexit, these are some of the same issues that plague the United States as well right now. I still really enjoy Lucy’s character. Theres’s just something about her that I enjoy. She’s a smart cop, but she’s also got a lot of heart. It’s a nice combination to see. There seemed to be a lot more interaction with other police officers in this book than I remember in the previous books. It was nice to see some other secondary characters get quite a bit of attention in this installment. So while the political issues brought up in this book definitely have a current vibe, I hope it won’t be too off-putting to certain readers. Luckily, I am still looking forward to seeing more of Lucy Black in the future and will be eagerly awaiting the next installment from this series! 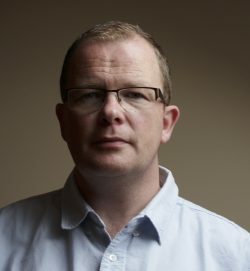 Brian McGilloway was born in Derry, Northern Ireland. After studying English at Queen’s University, Belfast, he took up a teaching position in St Columb’s College in Derry, where he was Head of English. He is the author of the New York Times bestselling Lucy Black series, all to be published by Witness. Brian lives near the Irish borderlands with his wife and their four children. Catch Up With Our Author On:Website 🔗, Goodreads 🔗, Twitter 🔗, & Facebook 🔗! There is a Rafflecopter giveaway! There will be 3 winners of one (1) non-Kindle eBook coupon for a copy of THE FORGOTTEN ONES by Brian McGilloway. The giveaway begins on June 24 and runs through August 1, 2017. You can find the Rafflecopter link HERE. The hall was already packed by the time Detective Inspector Tom Fleming arrived. The air was sweet with perfume and talc and, beneath that, from the farmers still wearing their work clothes, the scent of sweat and the smell of the earth. The congregation were on their feet, being led in the opening hymn by Pastor James Nixon. Fleming smiled apologetically at those he squeezed past to get to a free seat in the third row from the back. The hymn finished, the assembly took their seats just as Fleming reached his, and settled to listen to the words of Pastor Nixon. ‘My brothers and sisters, it is a great honour to be here with you this evening and to see so many of you have taken the time to come and pray with me.’ His voice was strong despite his age, a rich baritone still carrying the inflections of his native Ballymena accent. ‘But it is a time of great challenge for us all. Daily, all good people face an assault on their morality with the rampant homosexual agenda that assails us and belittles everything we hold to be true and dear. Men of conscience are tried for refusing to make a cake celebrating homosexuality or print leaflets and posters furthering that agenda. And on the other side of the border, the Irish Republic has voted to allow homosexuals to marry, as if two women playing house is no different to the consummated union of a man and a woman. As if it is not a perversion which shames us all. A few voices appended his comment with ‘Amen’. Another chorus of ‘Amens’ greeted his proclamation, accompanied by a smattering of applause which began at the front and rippled its way through the hall. Fleming glanced around at the others in the congregation. While one or two shifted uncomfortably in their seats, for the most part the listeners sat intently waiting for Nixon to continue. An elderly lady in the front row called out ‘Yes’, to the amusement of those around her. Nixon smiled mildly at her, as if indulging her. Excerpt from Bad Blood by Brian McGilloway. Copyright © 2017 by Brian McGilloway. Reproduced with permission from Witness Impulse. All rights reserved. Blurb: Mexican strongman Manuel Perrine slaughters rivals as effortlessly as he wears his trademark white linen suits. Detective Michael Bennett is the only U.S. official ever to succeed in putting him behind bars. But now Perrine is out and vows to kill Bennett and everyone dear to him. Bennett and his ten adopted children are on a secluded California farm, guarded by the FBI’s witness protection program. When Perrine begins a campaign of assassinations across the country, the FBI asks Bennett to risk it all – his careers, his family, his own life – to fight Perrine’s war on America. Review: This is the sixth book in the Michael Bennett series. I read the fifth installment, I Michael Bennett, back in April and was left with this huge cliffhanger – the Bennett’s being placed into the witness protection program. So I was anxious to get to this book sooner rather than later. I immediately ordered it off of Paperbackswap. So I was glad that it fit a recent callout for a Goodreads challenge I’m doing. It gave me a reason to pick it up. And while this book wasn’t necessarily a bad book, it just could have been better. I think it’s mainly because Michael Bennett was out of his element. I wanted him on a case, working a homicide. And the parts where the farm and whatnot was described, just didn’t feel right for this series. It definitely picked up once Bennett was called into the thick of things with the investigation to find Perrine. So I’m glad I finally got the resolution I was looking for after the fifth book. I’m not entirely convinced that it needed an entire book in and of itself, but hey, I’ll continue to read the Michael Bennett series, I still like his character a lot. And I’m anxious to see if him and Mary Catherine will finally stop denying the inevitable and just get together already!! Blurb: Willie Sutton was born in the squalid Irish slums of Brooklyn, in the first year of the twentieth century, and came of age at a time when banks were out of control. If they weren’t failing outright, causing countless Americans to lose their jobs and homes, they were being propped up with emergency bailouts. Trapped in a cycle of panics, depressions and soaring unemployment, Sutton saw only one way out, only one way to win the girl of his dreams. So began the career of America’s most successful bank robber. Over three decades Sutton became so good at breaking into banks, and such a master at breaking out of prisons, police called him one of the most dangerous men in New York, and the FBI put him on its first-ever Most Wanted List. Blending vast research with vivid imagination, Pulitzer Prize winner J.R. Moehringer brings Willie Sutton blazing back to life. In Moehringer’s retelling, it was more than poverty or rage at society that drove Sutton. It was one unforgettable woman. In all Sutton’s crimes and confinements, his first love (and first accomplice) was never far from his thoughts. And when Sutton finally walked free – a surprise pardon on Christmas Eve, 1969 – he immediately set out to find her. Review: This book has been sitting on my shelf for a few years now and I decided it was finally time to get to it. Maybe I had too high of expectations for this one. I have been reading more historical fiction this year than normal, and they’ve all been winners. So I went into this one thinking I’d really enjoy it. But it ultimately fell a little flat for me. I found it hard to get into. I’m not sure if it was the writing style with the constant flashbacks or the actually story itself. But something just didn’t click very well with me. Obviously it wasn’t a terrible book, because I did finish it. But it’s not something that appealed to me a great deal. I found Willie’s character to be completely unreliable at the end and I struggled with a big revelation near the very end of the book. I wasn’t prepared really for how things turned out and so I was a little frustrated by that. So this one was just an “ok” book for me. Blurb: Bus McIntyre, small-town lawyer and Sixties survivor, is presented with evidence from the cold-case murder of his father Dean, a hard-drinking cop, four decades ago. It reveals Dean’s ties to a dead Mafia kingpin – and the assassination of JFK. Meanwhile, Banner McCoy, a young NSA data analyst assigned to a project code-named KNOLL, goes into hiding when she learns its objective: eliminate anyone with information on what really happened in Dallas on November 22, 1963. When Bus falls into the agency’s sights, all paths lead to a small Louisiana town full of secrets, where the late don’s aged but indefatigable hit man awaits, determined to tie up all loose ends. Review: If you have followed my blog for any time, you know by now that I am a sucker for anything JFK related. It’s a strange obsession I have. I gobble everything up about him, his life, his family, his presidency, his assassination, etc. So it was no surprise that when I was pitched this book I immediately jumped on the opportunity. I will say that this book started out really slow for me. I had a hard time getting into the flow of the writing. It was a little bit of a strange start, really. But once I finally got into the book, I found it to be quite enjoyable. I think my main complaint (if you can even call it that…) is that this book could have been a lot longer. I felt like there were a lot of things that could have been expanded upon. First of all there could have been a lot more to Banner’s story. This book kind of opens up and you’re just thrown into everything. I think that’s what had me so confused in the beginning. I felt like there could have been a lot more meat to the story than there actually was. A lot more background would have been nice as well. It’s a fine line sometimes, though. I know I have complained numerous times that a book could have been 100 pages shorter … this one I just feel could have been 100 pages longer! Even so, without that “meat” I would have preferred a little more of, I still enjoyed this book. It was an interesting spin on the JFK assassination. I would definitely recommend this book to JFK junkies like myself as well as mystery fans. I received a copy of this book for free in exchange for an honest review. All opinions are my own. Blurb: I am a beast. Review: This book was the title featured on Barnes & Noble’s Serial Reads for the month of May. I was really hesitant to start it to be honest, it’s completely outside of my comfort zone. Not only is this book a YA, it’s also a fairy tale re-telling. I wasn’t sure if I would enjoy this … I mean how many ways can Beauty and the Beast really be spun? But I figured it was free and if I didn’t like it I could always walk away from it. Since I’m reviewing it here, I obviously finished it. It was a cute read for the most part. You could definitely tell it was a little dated (MySpace?!?) and more juvenile than I normally read. But overall it wasn’t a bad book. It was a pretty standard re-telling in my opinion. But there was just enough there to make it feel a little more original. Not a bad book, but probably not one that will be very memorable for me in the long run. But it was good to read something out of my comfort zone. I’d recommend it if you’re into young adult and/or re-tellings.